Incredible scenes in Essex where a disabled man survived being hit by a train going at 100mph, suffering only minor injuries. 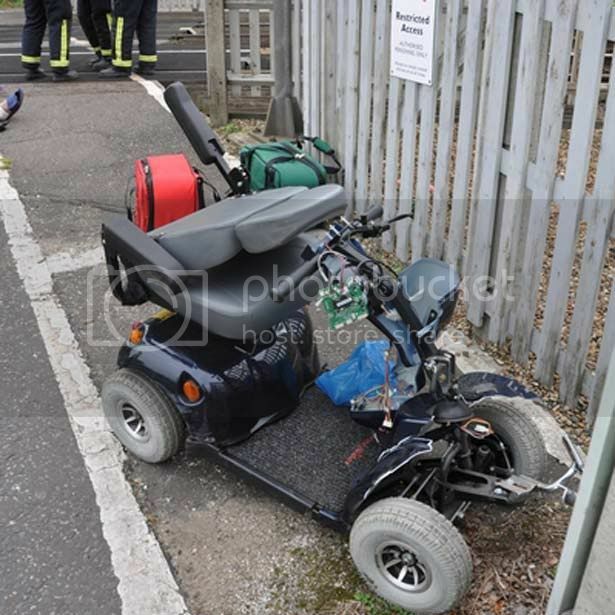 Father-of-four Tony Winskill, 43, of Kelvedon, was travelling on his mobility scooter when he drove on to a level crossing. When the locomotive hit he was thrown free from the scooter, which was mangled against rails. The Colchester-bound train's driver had braked but was going so fast it took half a mile to stop. Sources from the emergency services at the scene said Tony appeared to have been, you know, drinking. Fireman John Harris said: "If he had been only a couple of inches further forward he would have undoubtedly been killed."